Our school needed a change. It was the spring of 2015, and Central High School’s Positive Behavioral Interventions and Supports (PBIS) team was in its second year, envisioning ways to positively impact the culture of our school. The prior year, our PBIS team had created monthly school-wide lessons on our expectations for them as students, citizens, and people, with no noticeable changes in positive behavior; we couldn’t figure out what we were doing wrong. In order to really accomplish something, we figured out that we needed a program that was student-driven. The proposal was made to start a new leadership class – one unlike anything our school had ever offered. Students would take the lead in helping staff create messages that their peers could relate to. Little did I know when we came up with this brilliant idea that I would be the one asked to teach the class. When our administration said that they thought I was the teacher for this task and that it could work with my schedule, I agreed. It was an exciting, yet overwhelming opportunity; there was no curriculum, and I was tasked with the “simple” goal of creating a student-driven class that would develop lessons and activities designed to create a positive culture and climate in our school and community—no big deal! I only had the spring term to recruit students to sign up for a class that they had never heard of, and I couldn’t really even tell them what we would be doing. Fortunately, we had an awesome response from our students, and the CHS Power Peer class was ready to launch – or, as ready as it could be. Some of my students who have been in the class since it began joke about how, “Mrs. Larson forced me to sign up for the class.” At least I think they’re joking since they’ve stayed with me year after year. That summer, I worked with another member of our PBIS team, Laura Waight, and together we developed a rough outline of monthly lessons to teach our school expectations through our P.O.W.E.R. matrix, (P=purpose, O=ownership, W=work ethic, E=empathy, and R=respect). The PBIS team had designed several lessons for the first few weeks of school to teach students about behavior expectations, including a school-wide lesson for the first day of school to kick off the 2015-16 school year. I was excited to get feedback from the Power Peers about our first PBIS lesson of the year, since they were dispersed into different classroom “focus groups” while the lesson was taught. Their notes were a little disheartening. Some teachers had not taught the PBIS lesson in their classroom, and those who did each presented it a bit differently, sometimes going off on unrelated tangents or opting not to finish all the parts. There wasn’t a consistent message going out to our students and staff about the expectations in our school. Students also thought the lessons were too detailed and boring. Back to the drawing board. At least this time around, we had the right resources to help find a better solution – the Power Peers themselves. 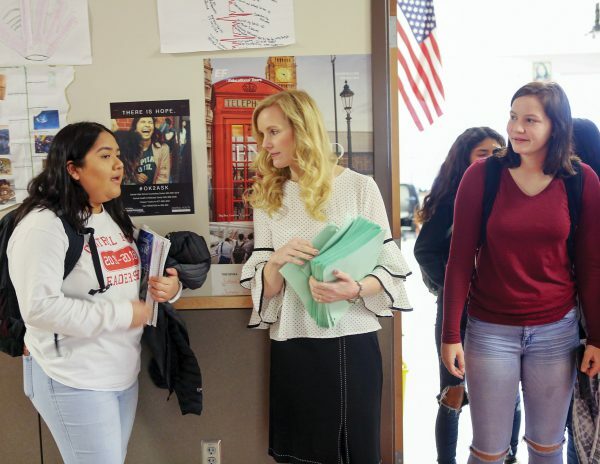 The students suggested making video lessons so that teachers would not have extra work, and the same message would be played in each classroom; this would create the consistency we had been lacking. I panicked a little at the thought of making monthly videos due to my own personal technology deficiencies, but the kids assured me they knew how to do it. We even had one student who had film editing experience. They wanted to ditch the lesson the PBIS team had created for the following week and make a video. We had just a few days to write a script, assign parts, come up with an engaging activity, get supplies for 1000 students, edit, and share the video with staff. Somehow, we pulled it off. Our first lesson on “Finding your Purpose” was created. This class truly was unique. Most traditional leadership courses require students to run for office or give a speech to the student body, which can be very intimidating for many students. Any student who wanted to sign up could take this class. We ended up with an incredibly diverse group, which was wonderful because we had representation in our class from all walks of life. Our messages were more realistic and relatable to our student body, since there was at least one person in the class who all other students knew or could relate to. 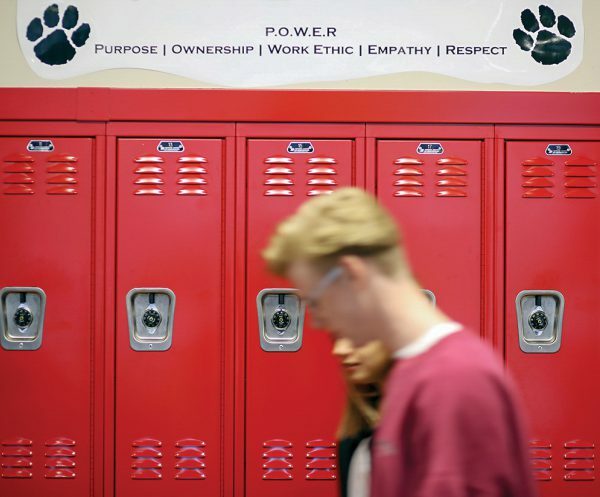 Roseanna Larson's Power Peers class creates projects that help their fellow students at Central High School. As the year progressed, we continued to develop monthly lessons, using the students’ ideas to improve the school culture and climate. One of my favorites was a video on the importance of empathy. Our school is fortunate enough to have recently gotten a school-based health center, the Central Health and Wellness Center, located across the street from CHS. Our class decided to form a partnership with the center, and we were able to get three water-bottle filling stations for our school through one of their grant programs. We also were able to provide water bottles with a student-designed CHS logo to all students and staff. Our partnership with the center led to an introduction to Doug Gouge and Stephanie Gilbert from the Mid-Valley Suicide Prevention Coalition. Mental health awareness for young people is so important, and knowing what to do in the event that someone you know is thinking of suicide can save a life. Our class had the opportunity for Gouge to train us in QPR (Question, Persuade, Refer), which is a suicide prevention approach that uses a similar model to CPR. Suicide prevention and mental health awareness were two areas that the class wanted to promote at our school and in the community. Having lost my own father to suicide as a teenager, these areas were very close to my heart. Signs from an anti-suicide video the class produced. In the fall of 2016, we were approached by Mid-Valley Suicide Prevention Coalition with the idea of continuing our partnership by creating two videos about mental health awareness. We had a group of students who were passionate about this subject, so we started to have planning sessions to discuss ideas for the videos. During the planning phase, Doug Gouge arranged for the group to work with Talewind Visuals, a media company who did all the amazing filming and editing for this project. It was decided that the videos would not have any speaking parts, just students, music, and words. The effect was tremendously powerful. When our class previewed the first video, You Are Not Alone, #OK2ASK, we could not believe how well it all came together. Our students were in awe of the power behind their message. The school was planning to kick off a yearlong campaign to promote mental health awareness in the fall of 2017, and we were excited to show our video to the entire student body. We wanted our staff to see the video before showing it to students, so I shared it during our staff meeting the week before the release. I was surprised that there was no response from our staff after showing the video, and at first, I thought that they did not care for it. Then the lights came back on and I could see the impact on their faces. Many of them told me later that they simply had no words. After school on Oct. 11, we put up posters that had been created from still shots of the video all around our school. We wanted to get students talking about the posters as soon as they arrived at school the next day, before they saw the video during our school-wide video lesson. Gouge’s team had cards made in English and Spanish that were identical to the cards used in the video with the message, “Need someone to talk to?” on one side, and three resources with phone numbers where students could get help on the other side. These cards had been distributed to all of the teachers at CHS to give out after showing the video as part of the campaign. 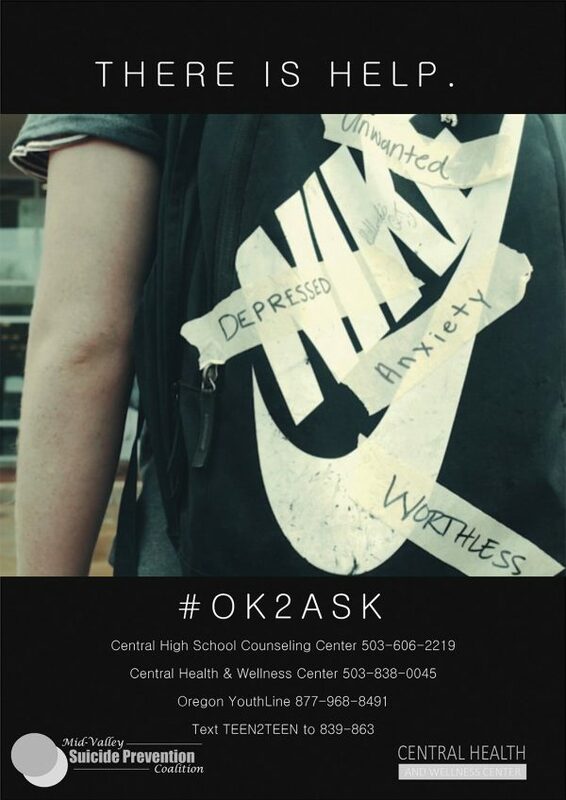 While the video was shown in all classrooms at CHS, the Mid-Valley Suicide Prevention Coalition simultaneously posted the video on social media and their webpage. The response has been overwhelming. The impact made by this project has been felt by students at CHS, and around the world. Students who starred in the video immediately had friends, family members, and strangers messaging them about how amazing it was. I had emails and messages coming in from mental health agencies, law enforcement agencies, other schools, and community members. It spoke to everyone who has ever struggled in life, watched a loved one struggle, or felt alone. Suicide is the second leading cause of death for young people (aged 15-24) globally. Lesbian, gay, and bisexual kids are three times more likely than straight kids to attempt suicide at some point in their lives. African American, Latino, Native American, and Asian American people who are lesbian, gay, or bisexual attempt suicide at especially high rates. Lesbian, gay, and bisexual young people who come from families that reject or do not accept them are over eight times more likely to attempt suicide than those whose families accept them. Nearly 20 percent of teen girls (aged 12-17) in the United States report major depressive episodes within the last year. 40 percent of all people with a serious mental health issue do not seek treatment. 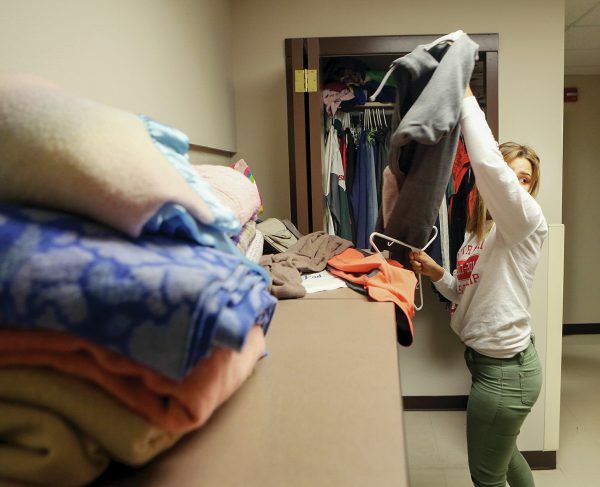 Savannah Mendoza, a student in Larson's Power Peers class, arranges donated clothes in the student-run pantry. We have continued our campaign by teaching our students and staff about regulating tools to help reduce stress and anxiety. In our video lesson for February, we will be focusing on how to control “flipping your lid,” which is part of mental health awareness and our trauma-informed approach at CHS. We will be releasing the second video we made with Doug Gouge and his team in the spring. The Power Peers are truly an amazing group of students with a desire to serve others and make a positive difference in the world. What they have accomplished in the two and half years since we started this class is astonishing, makes me incredibly proud, and to be totally honest, a bit exhausted. These young leaders are the reason I love teaching and inspire me each day. The Suicide Awareness Voices of Education (SAVE) is an organization that provides resources for teachers, parents, students, and students on mental health awareness. They offer screenings for depression, coping resources for loved ones, and information about mental health awareness events. Visit www.save.org to learn how you can help prevent teen suicides.